[Mother Clone Zinfandel] is aged in American oak and blended with 12% Petite Sirah. Concentrated blackberry fruit rides a foundation of soft, silky and well-integrated succulence, with touches of leather saddle, black pepper, smoke and brick. While full bodied, it manages to drink light on its feet. If you like big Zins (or big California red blends), check your nearest Costco. I’m heading to mine to stock up. 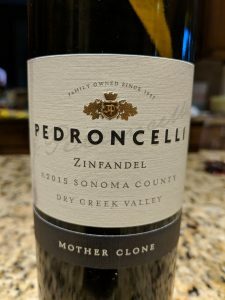 This entry was posted in Red Wines, Zinfandel and tagged california, costco, dry creek, pedroncelli, sonoma county, zinfandel on October 14, 2018 by Roger.